Spring is officially here in Wisconsin! I have been to a flower nursery, talked myself down from buying all-the-flowers and am getting my hands dirty in my yard. I created this DIY hanging planter, how to create using wood pallets a few years ago, but never shared it here on the blog. I felt it was the perfect season for this little cutie to be shared. 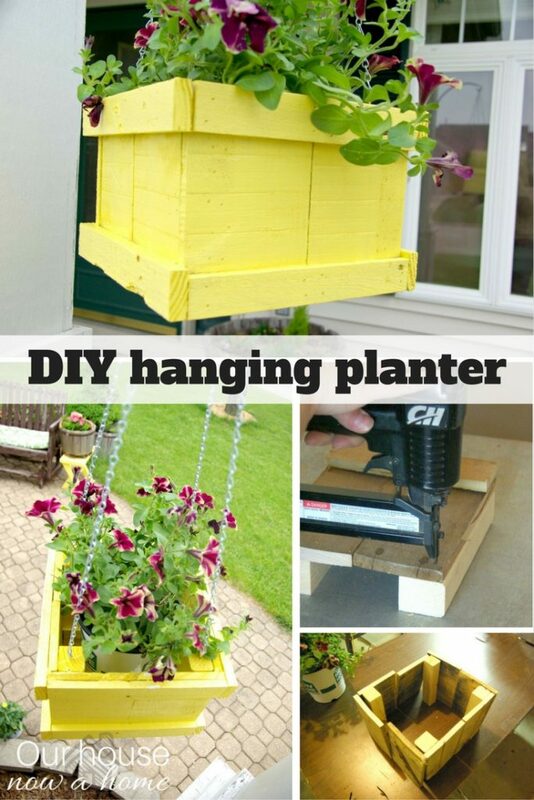 Making this DIY hanging planter is pretty simple and straight forward. 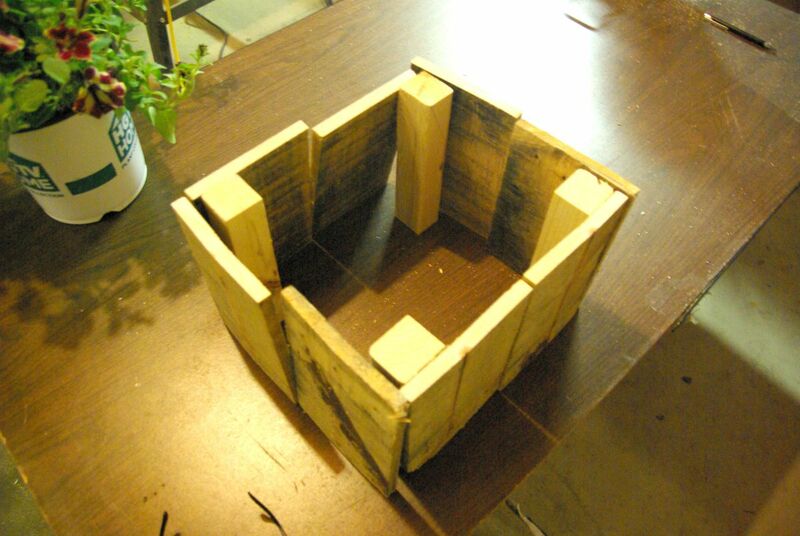 The first step is to decide how large of a planter to make. I am making it to fit any standard sized flowers that you can get from any store in their own container. 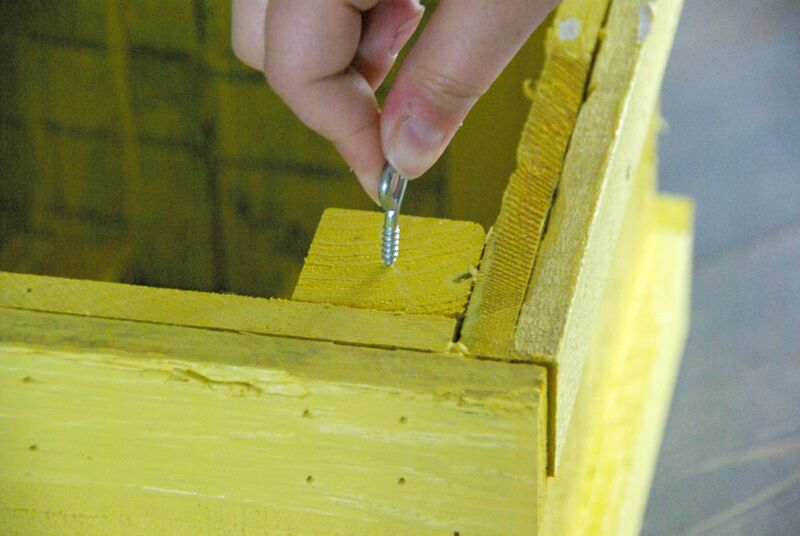 This will allow the hanging planter to be easily changed each season with new flowers. 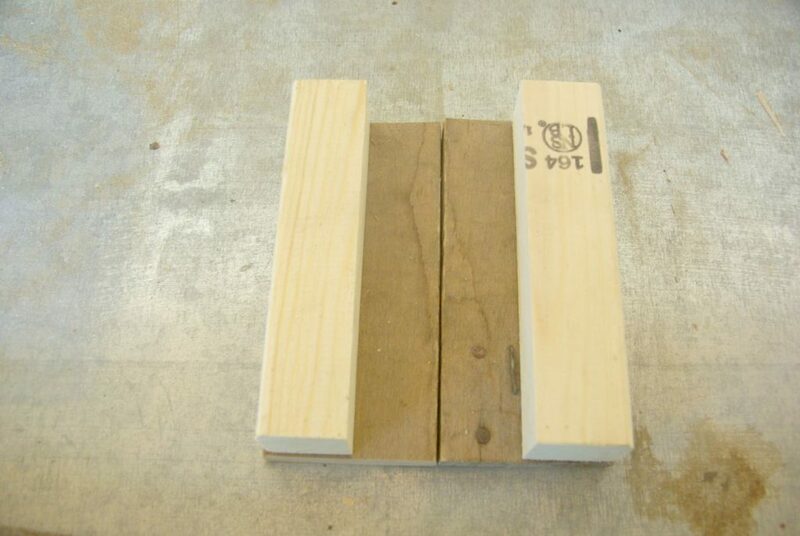 I got a regular 2×4 and then cut it in half. 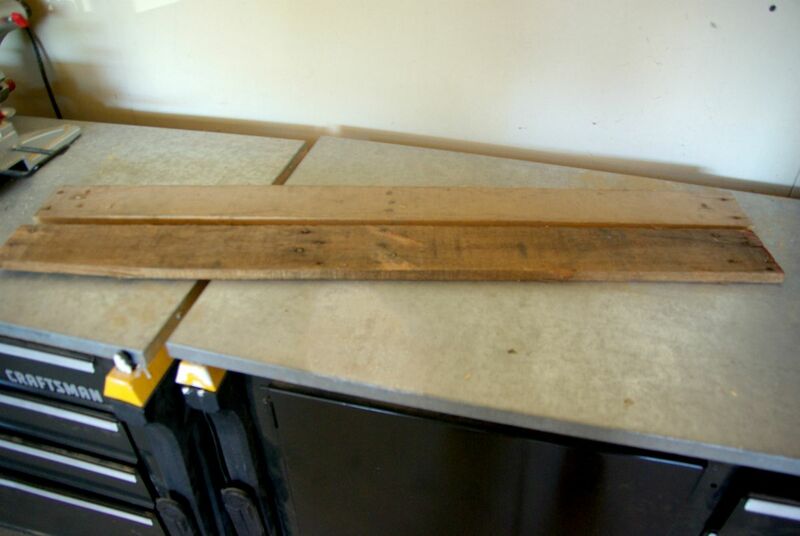 After that I split the newly cut 2×4 down the middle long ways. I could have left them the full size but want to minimize the size of this. These will be on the inside of the box, so making them a little slimmer will allow for more options with flowers to set inside. These are what is going to be the center of the planter box. I made 4 of them to be on each interior corner. Wood pallet time! 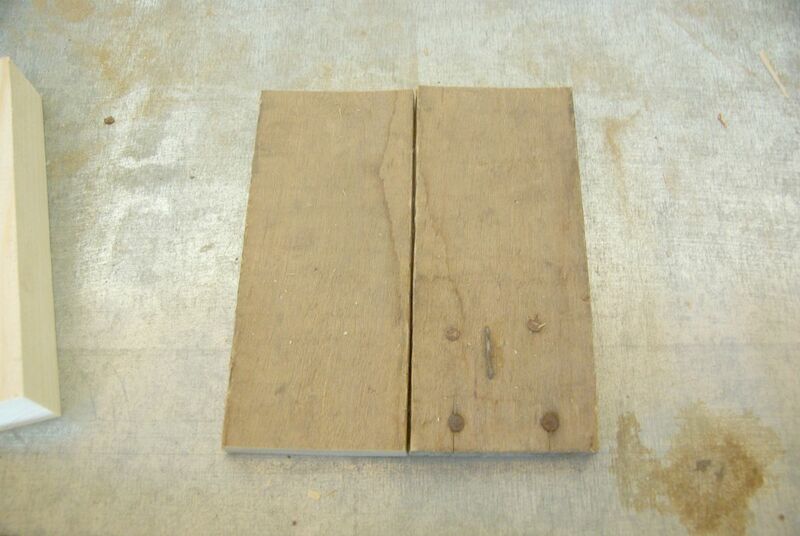 I already separated these pieces from the wood pallet. 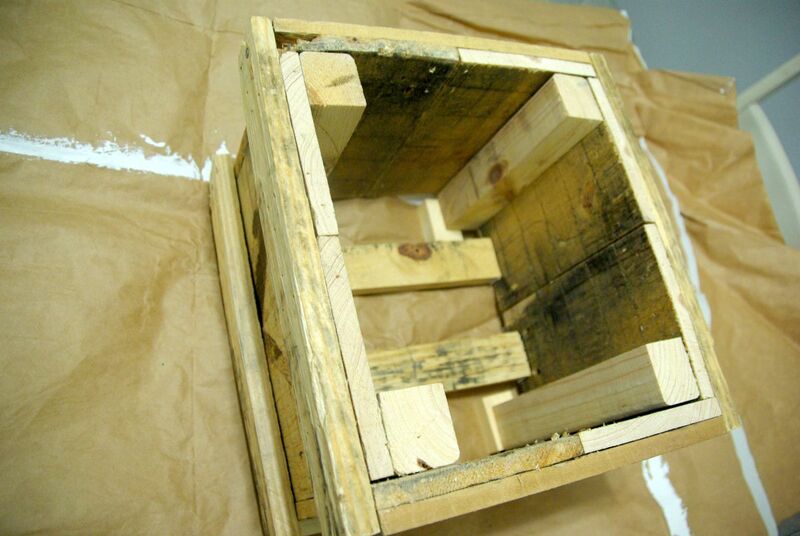 These wood pallets are going to sit up and down, so side-by-side forming the sides of the hanging box. I used the other 2×4 boards already cut as my template on how long these needed to be. 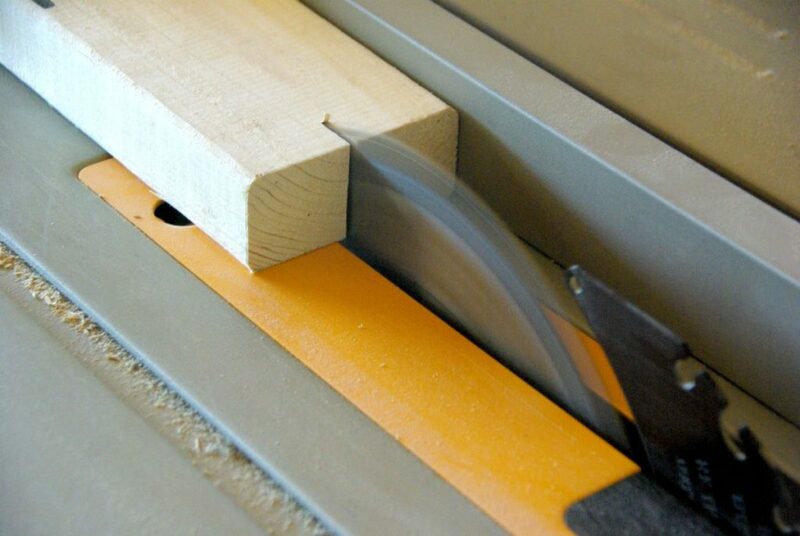 Here you can see how the sides are being made. 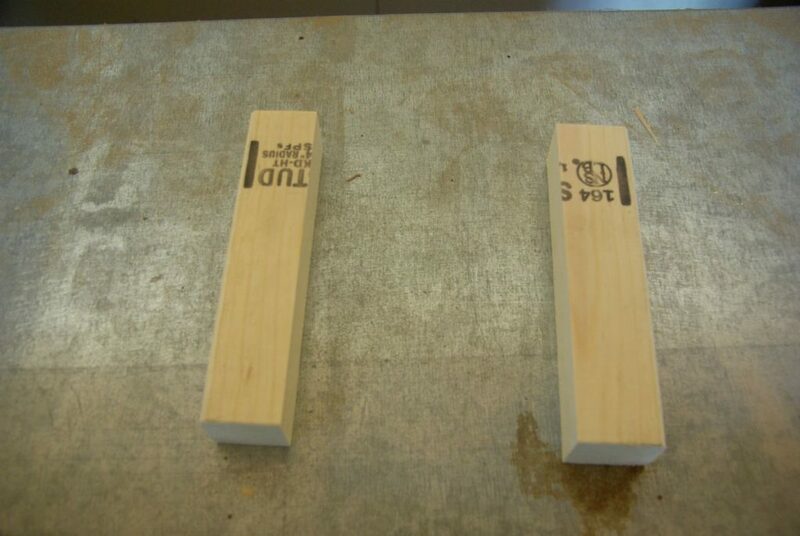 The wood pallets will be on the outside and the smaller wood pieces will be on the inside. I used an air nailer to attach these. 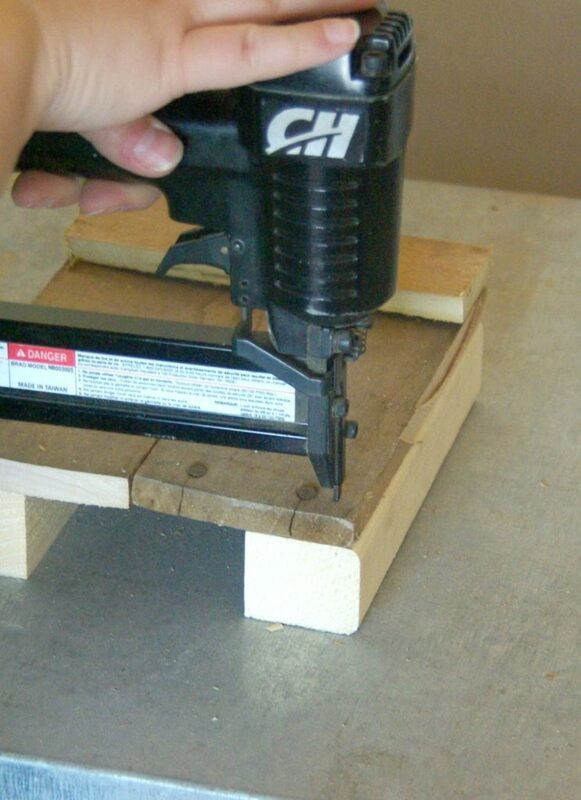 However if you do not have that a hammer and nails will work, or wood glue. I repeated this step for all 4 sides. Here is how the hanging planter will be situated. I felt that it still looked a little rough. I added a few finishing touches, putting smaller wood pieces on the top and the bottom. Creating a trim appearance. When working with wood pallets it is important to try and add some finishing touches to have the piece feel a little more complete. The pallet’s itself will always have a rough appearance. So things like the trim pieces on top and bottom add just that. The bottom I used two pallets cut down to size and nailed them to the bottom of the planter. I did not want to completely box it in because when I water the plant I wanted the excess water to have a way to get out. Leaving the bottom somewhat open allows this to happen, but still has a bottom that will support the flowers set inside it. 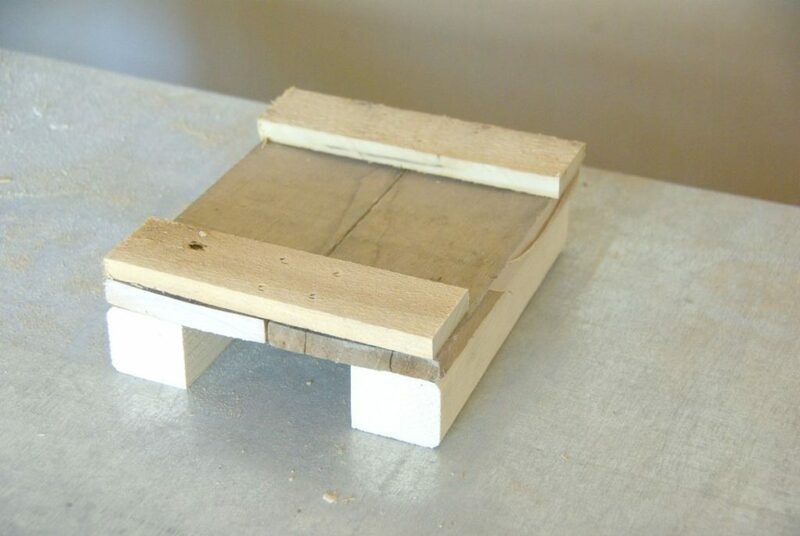 Wood pallets should always been sanded down slightly, otherwise they are very rough feeling and can be difficult to paint. 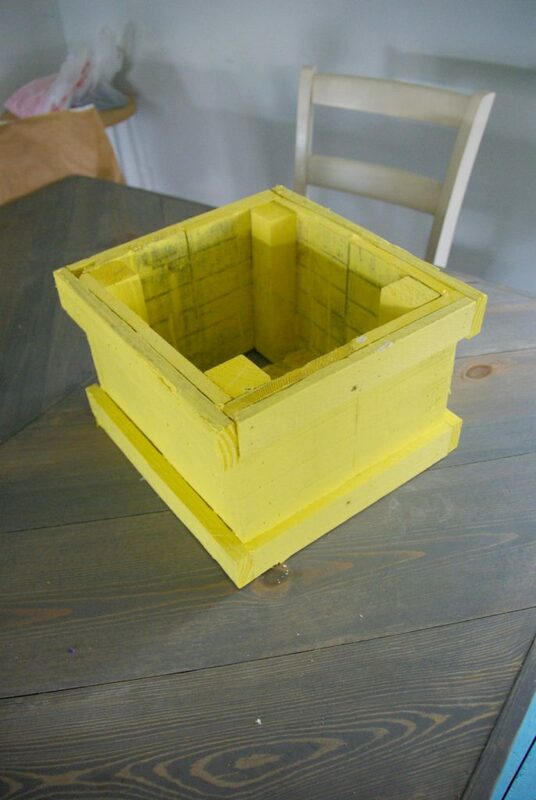 Two coats of bright yellow paint later and the box is done. Time to turn this into a hanging box! I had some screw in hooks. Placing them on top of the center wood pieces on the inside of the planter. I simply turned them and screwed them into the board. It took a little muscle, but I was able to do it with no other tools needed. I did this for all 4 interior boards. I purchased a long chain, with smaller loops. I wanted a more delicate appearance. If I had wanted it to appear bulkier, getting a thicker chain would have given me that appearance. Measuring the location I want the planter to be and then how much I wanted it to hang down. 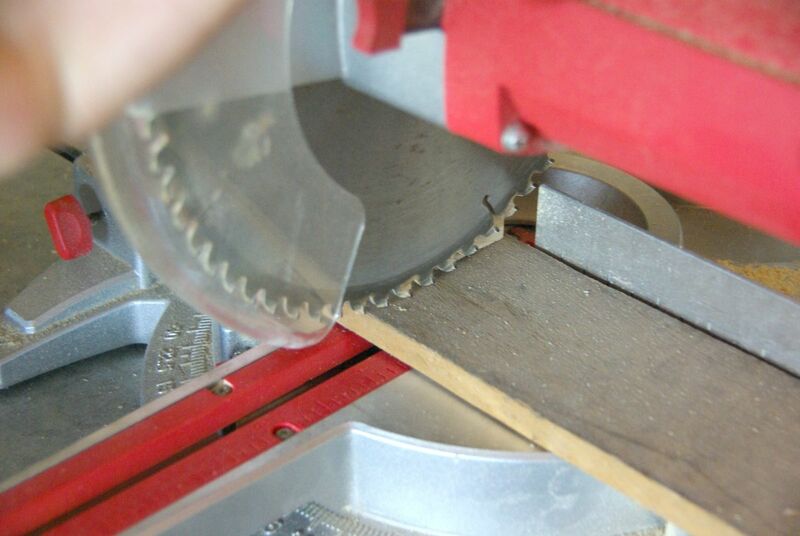 This will determine how much to cut for the chain. 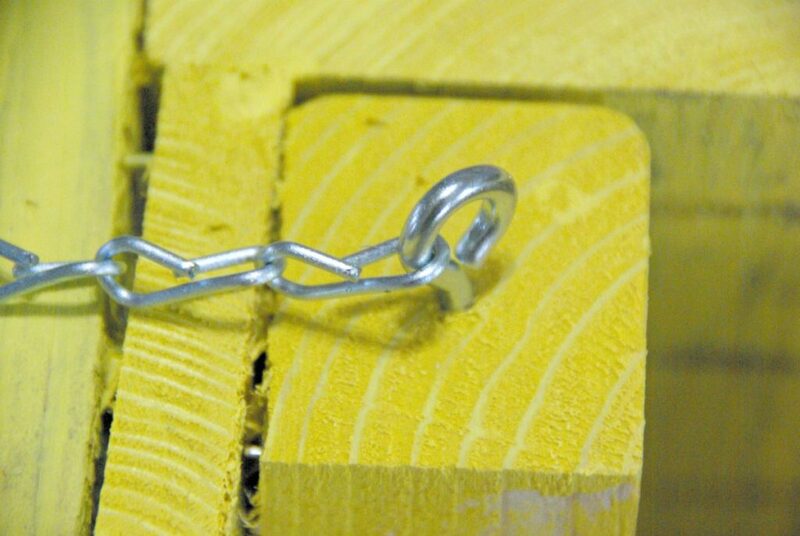 Using pliers to pull the chain links apart at the spot needed. 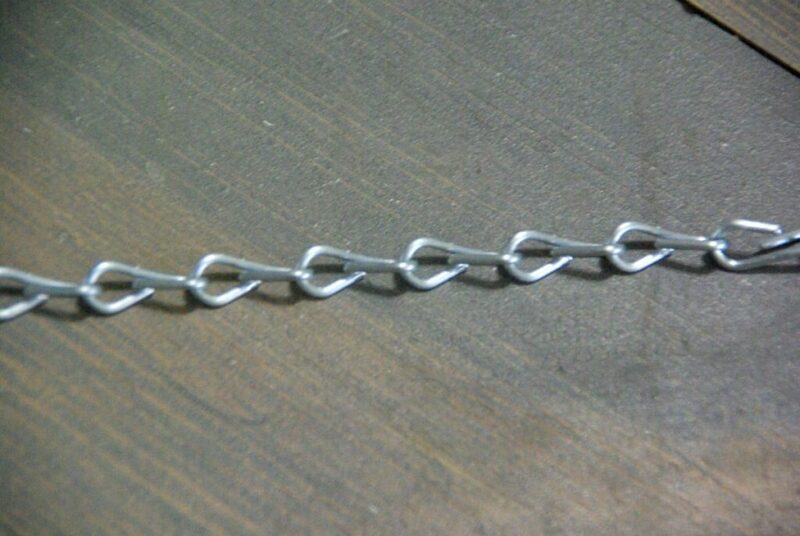 This separates the chain and now gives you the needed length. I doubled the length I needed to the chain. I am going to be placing the chain with both ends connected to the planter. So there will be only two chain’s used to hang this. The chains will criss-cross in the center at the top. 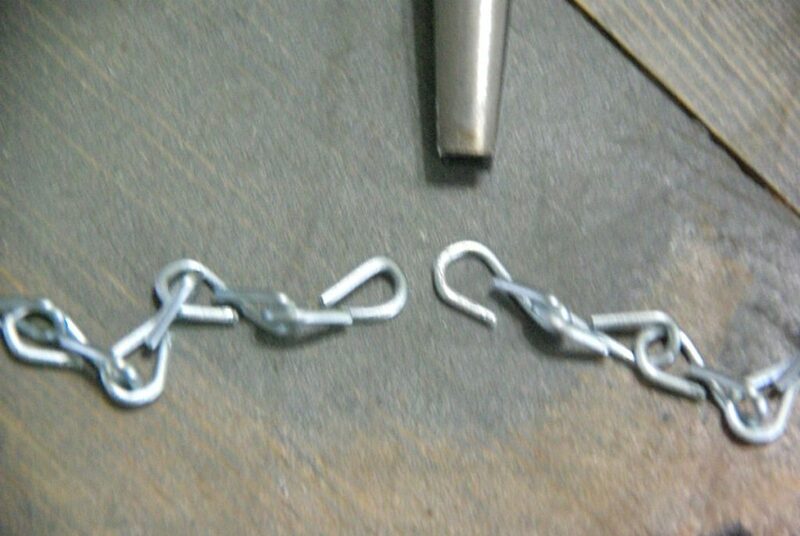 Opening up one link and looping it into the hook. The running the other end through the corresponding diagonal hook. Tada! I want to remind everyone that I made this planter over two years ago, so some of these pictures were taken then with purple flowers. A few pictures were also taken a few days ago with white flowers. Sorry for the confusion. With three years of blogging projects get lost in the shuffle of life and this one was a long time coming to share here. I love the rustic appeal to this. Not using wood pallets but regular wood is a great way to get a more polished look if that is what you prefer. 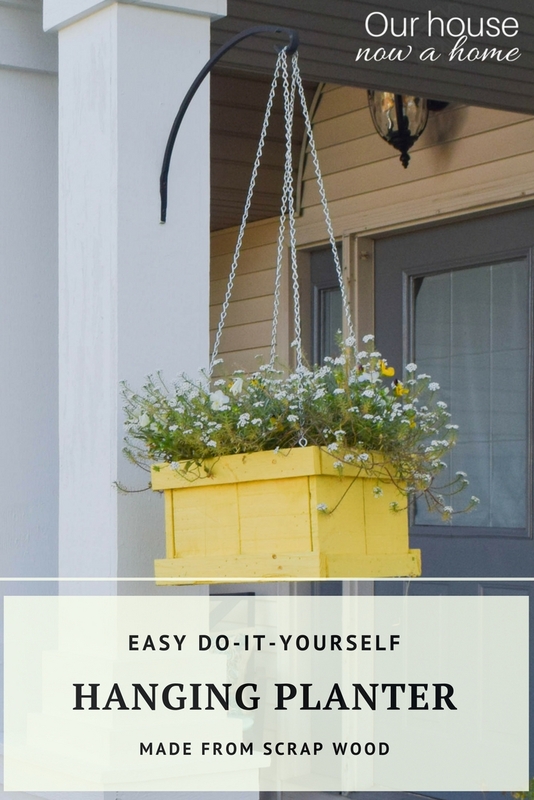 I love the ease of this DIY hanging planter, because I have used it for a few years now I get to tell you that this has lasted as is the whole time. 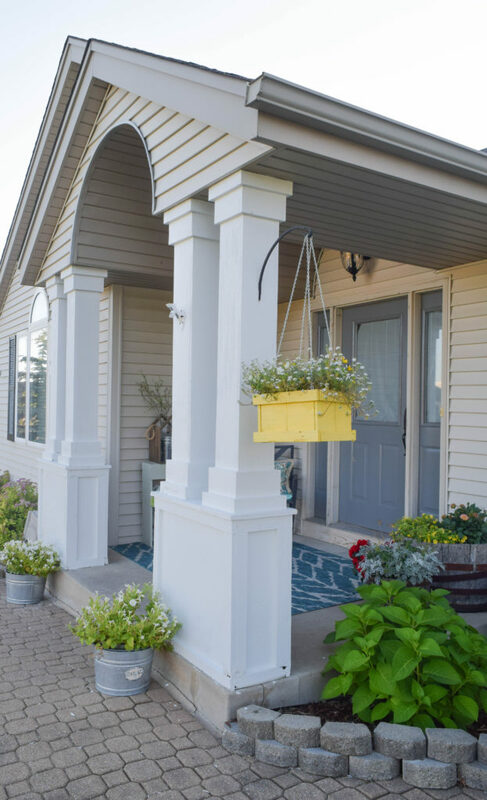 I am able to add new flowers each spring and it adds such a pretty color to my front porch. 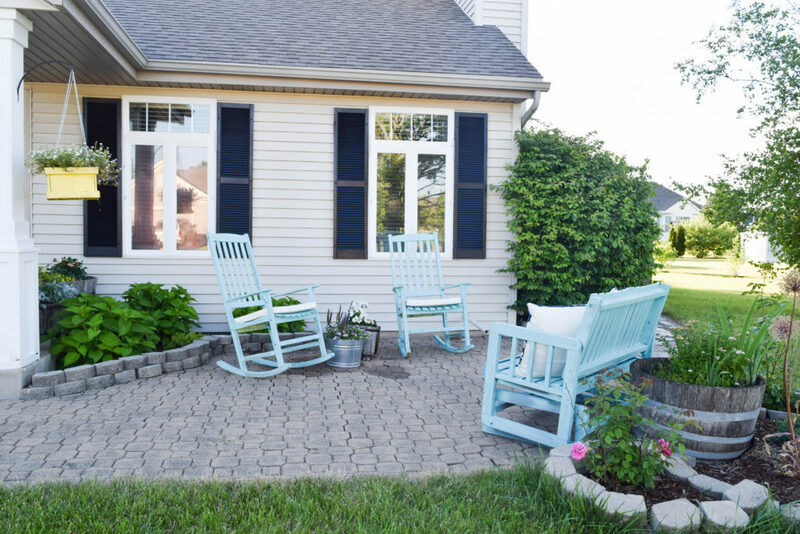 When decorating outside is where adding the bright pops of color can be done. 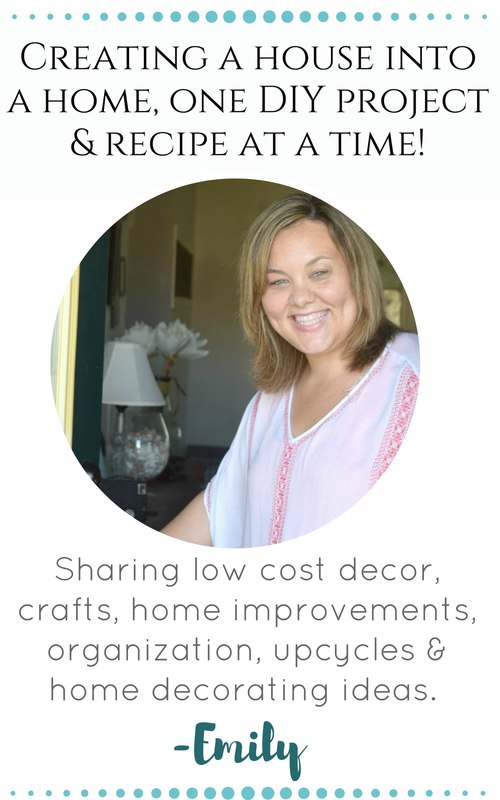 There is so much life and color outside naturally so going big in color and patterns can be done without it feeling like it overwhelms the space. This picture shows how long it lasts, this was taken a few days ago… well over two years since I made it. I have not altered it or repainted it since. I do bring this inside during winter, but otherwise it hangs as is. Oh Spring, you are lovely! 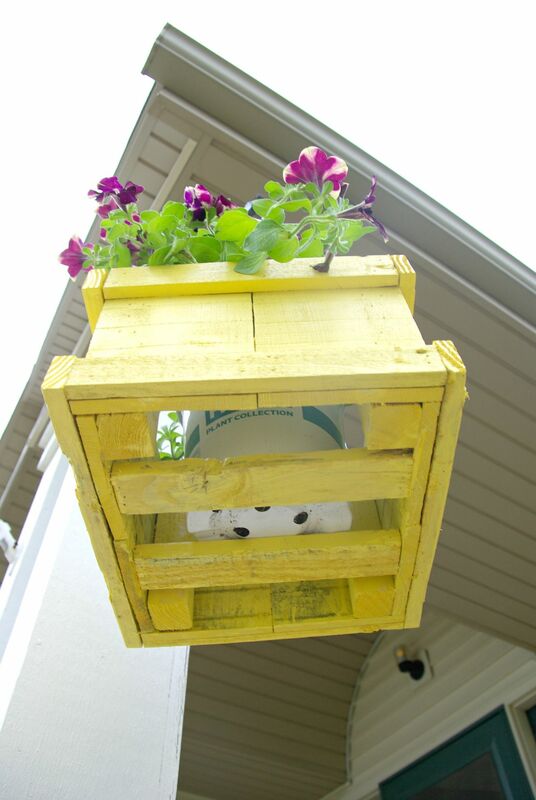 I love little projects like this DIY hanging planter, wood pallets, outdoor project. I would say total the price for this was maybe $10, and with the wood I purchased I could have easily made another planter with the left over wood. Anyone else ready for Spring?! I was born and raised in San Diego, California; now that I live in Wisconsin the second it warms up above 40 degrees I am ready to go in enjoying the outdoors. I put in a lot of effort into our outdoor space, adding flowers and other outdoor living areas. I try to soak in the spring and summer as much as possible. So this is my go time, my flower beds are calling to me and we have so many days relaxing in our outdoor space! Love how the planter turned out. I wish we had space for something like that in the front of the house, maybe I will do something like that on the deck. Wow! 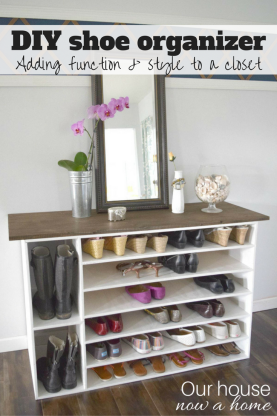 What a great diy project for the spring. You are giving those plants the right amount of love they need. I love the end result. 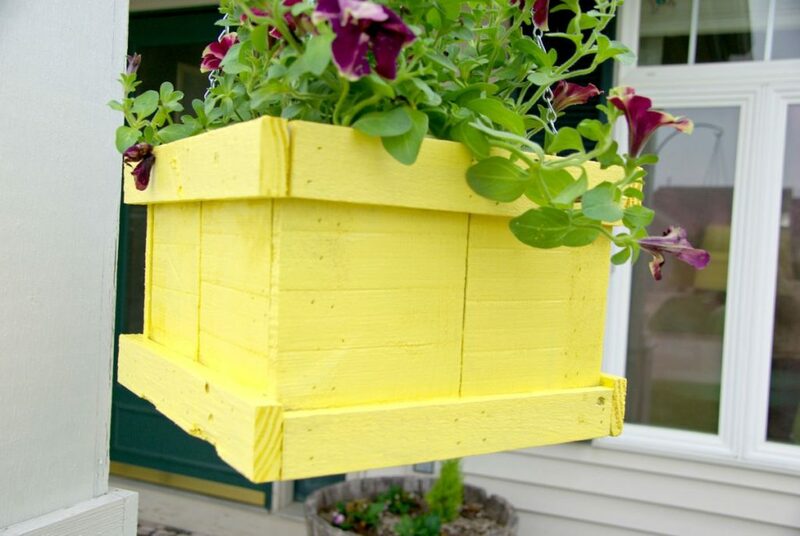 This DIY planter would be a great idea for my home this year! We want to jazz up our outdoor living space, and these would look lovely hanging on our porch and deck. I also like how it does not seem too difficult to put together. This looks like it could be a great project to do. It turned out so darling! 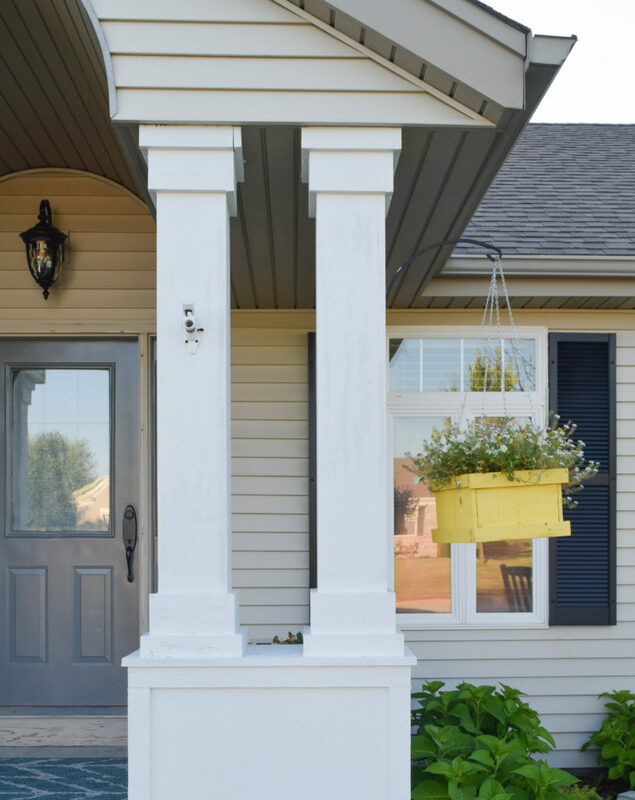 I love the bright pop of color on your lovely front patio. I may have to put artificial flowers in mine, because I’m horrible with plants! That looks wonderful! I love hanging flowers, and a rustic look is always my favorite. I can’t wait to give this a try. 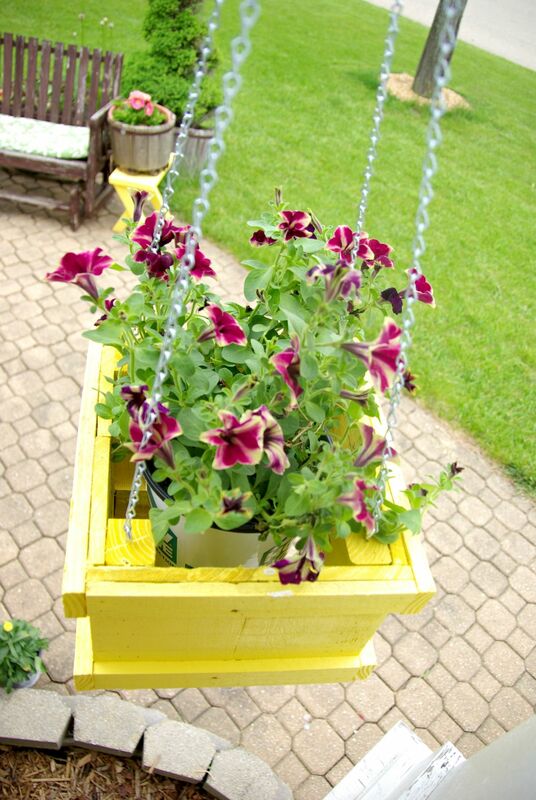 What a pretty planter, I love the rustic look paired with the bright color. I see a project in my husband’s future this weekend. I absolutely love this hanger. Thanks! I can already see what I’ll be doing this weekend – making this planter. I’m cool with that. It looks awesome, and my wife will be so happy with it. You did SUCH a great job! I love this. 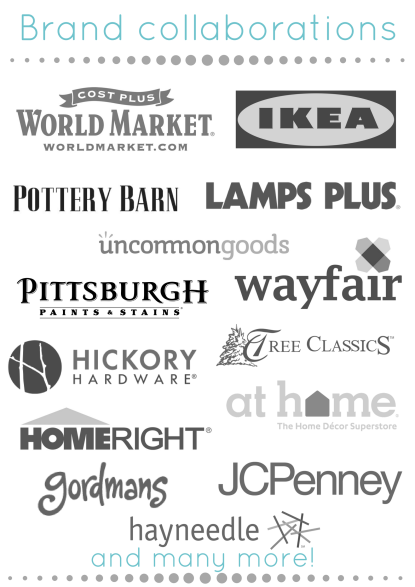 This will be a nice Father’s Day gift for my husband because he loves planters and he gets a ton of pallets from work. Nice planter. I love the DIY. This is so cute! Great work! 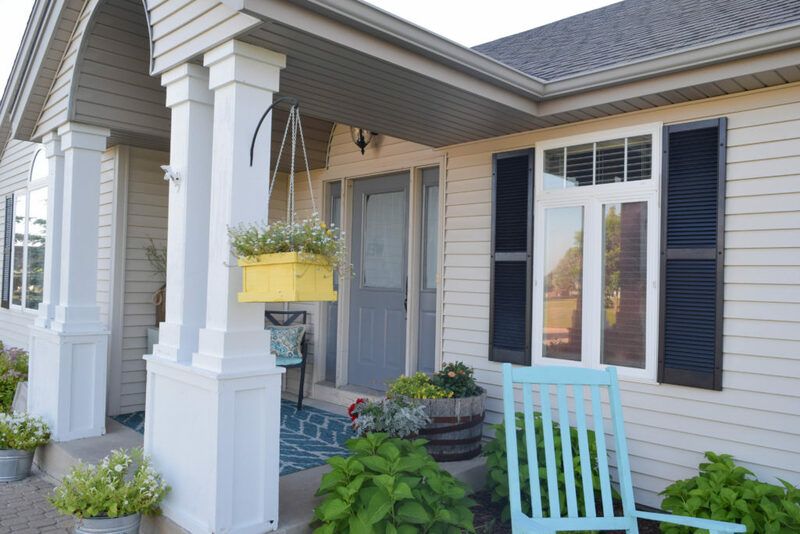 I would love to have a few hanging planter around front door or the patio. What a pretty ;hanging basket! I love how it adds a pop of color with the bright yellow. I love the color you used on the planter! The yellow really stands out. Is there a specific bran you use or will any type of paint will do? I love DIY projects. This looks so good! 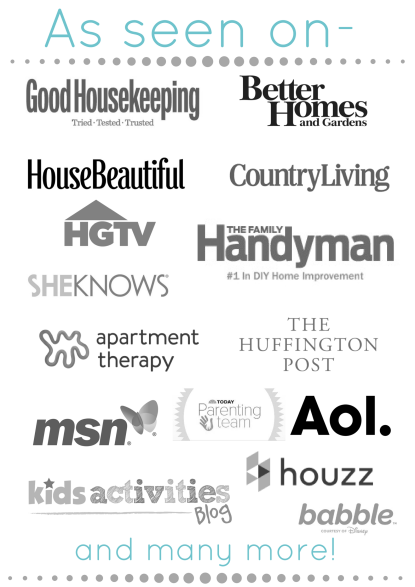 You’ve totally motivated me to do some things around my house! Oh my gosh! That is so LOVELY! I want one or ten! I am showing this to my hubby because he has the tools and tons of scrap wood! I expect him to make me a few. Love it! That’s a beautiful hanging planter. I love the color. It’s so cheerful. 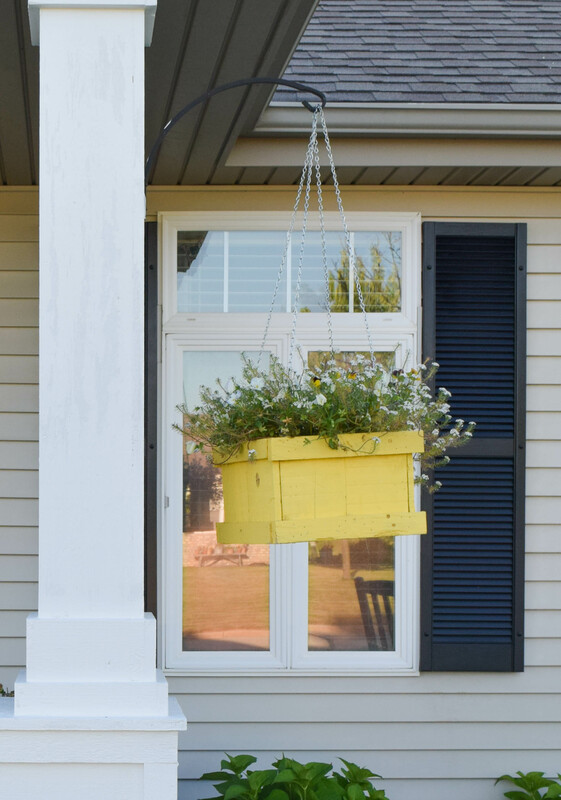 This DIY hanging planter is indeed gorgeous and I love the yellow color. Things like this I have always admired because they look so beautiful. They can really improve an area. Thanks for sharing the instructions. 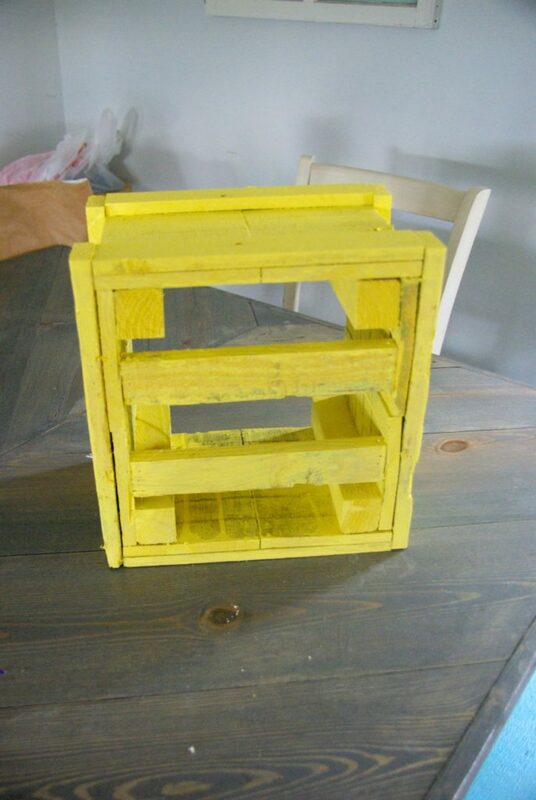 Wow, this is awesome and I love the color you painted the box, so vibrant and summery! I wish I can use tools as easy as you do! 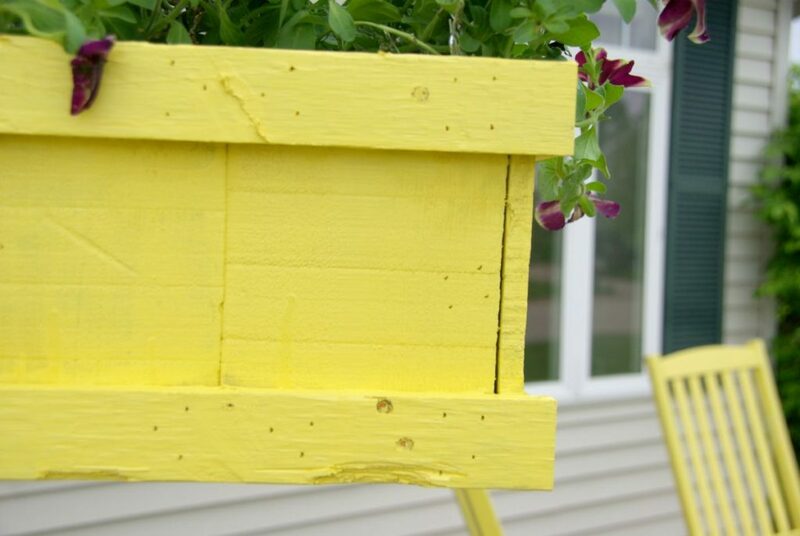 I’m sure this pallet planter project could become addictive! 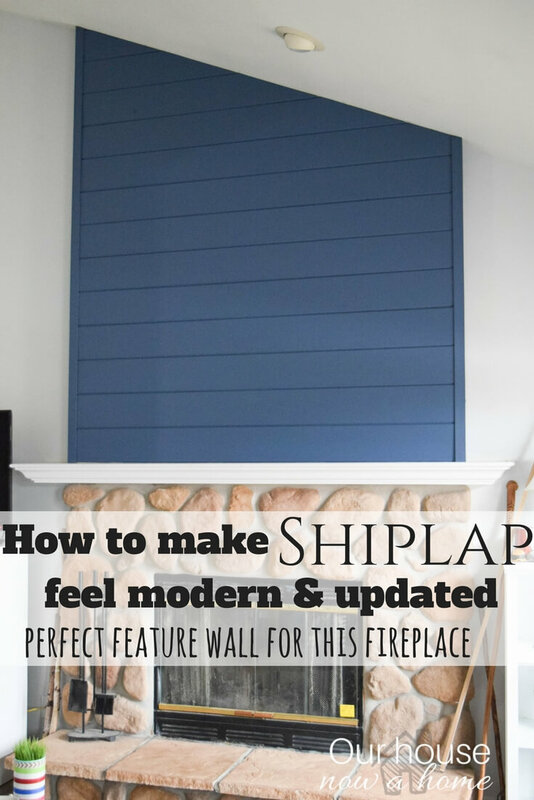 Pallets can be used as they are, given a coat of paint and hung on a wall as shelving. What a great DIY! This would make the perfect girt for mom for Mother’s Day! Doesn’t seem too complicated either! 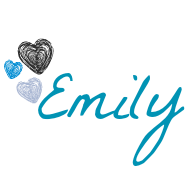 Love this Emily! I’d love to make one myself. The color is stunning! Wow this is a fantastic idea! I love the way it turned out! I just love this idea. We are moving soon and I want to make something like this. Awesome idea! 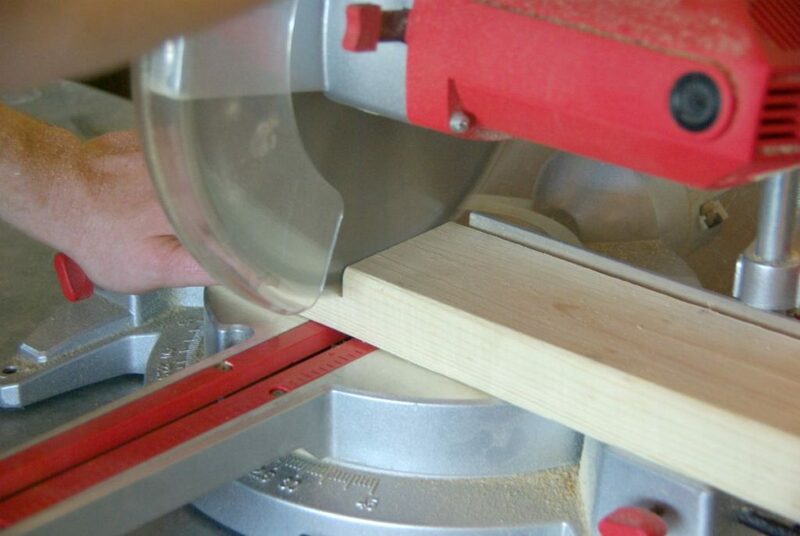 I want to make this just to use all the power tools! LOL I’m not much of a crafter, but I needed some idea for curb appeal this spring. Thanks! This is such an awesome idea. I think I may have to try this one myself. I love the way the yellow pops against your home. Made with wood pallets? That is so cool! I love this! I’m going to have to do the same where ever our home ends up! This looks adorable! I love the color and the flowers look great! 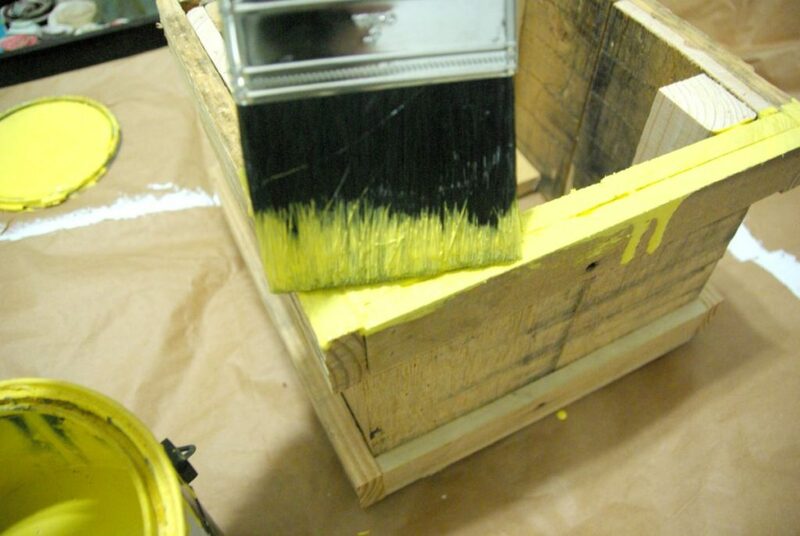 I love that bright yellow paint color. 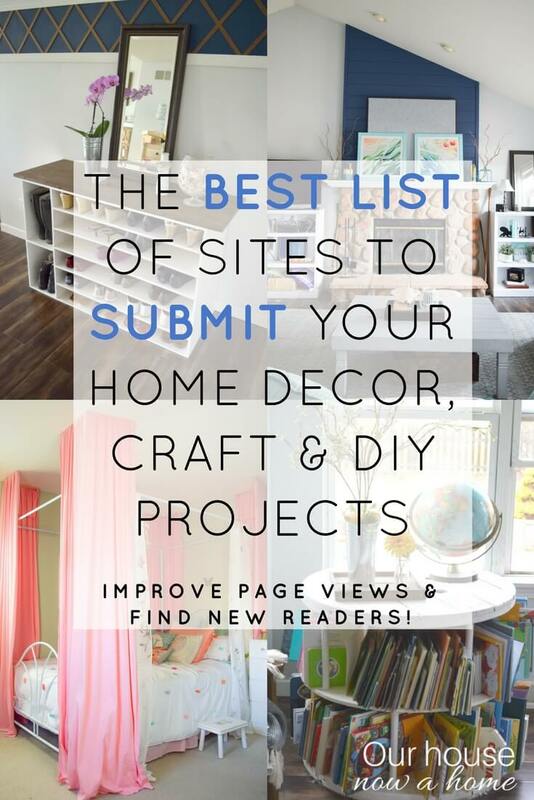 Adorable project and I need to re-create this! I’m always scared these hanging planters may fall. But you did a phenomenal job! I also love that it’s yellow.. such a perfect color.